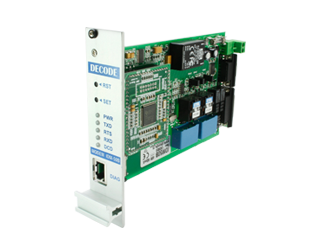 Modems are designed for use in SCADA systems mainly based upon power utility communication networks. Depending of modulation standard it can communicate through specialized, private or leased lines, radio links and power lines (PLC). Available as a desktop modem or in two different types of standard 19 inch rack. Employing frequency shift keyed (FSK) and quadrature amplitude modulation (QAM) for asynchronous and synchronous data transmission in 300-3400 Hz voice band, these modems are highly immune to interference and noise and permit extensive voice-band communication link utilization. Several international standards are supported ITU V.21, V.23, R.35, R.37, R.38A, R.38B, V.29, Bell 103, Bell 202 and proprietary Cegelec 1200/600 Bd and Indactic 33 communication standards.